Since Dave and Caiden did such a good job decorating the outside with lights and blow up Santas, Penguins and Snowmen...Caiden and I decided to give Dave a break from decorating. We decided to decorate the house together and surprise Dave when he came home. I didn't take pictures of the entire house decorated, but mostly because my back hurt so bad that I couldn't move for 2 days. No lie. I literally COULD NOT move. Strangest thing ever. 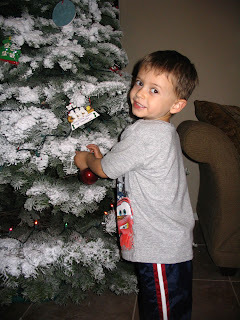 Caiden was a great helper...we had a lot of fun decorating the tree. We listened to Christmas music, had popcorn and hot cocoa, and decorated to our hearts content. 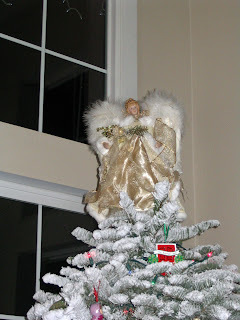 We did have a few casualties in the way of ornaments (nothing that can't be replaced) and I did battle with the lights on the tree (they won), but other than that I think the tree came out nice. 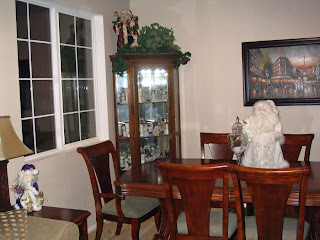 We decorated by the door, the dining room, the stairs and the living and family rooms. These aren't all of the stockings. 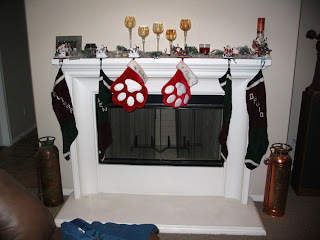 I couldn't figure out how to fit the cats...they are smaller version of the dog's stockings. Sue was kind enough to knit Kiya's name into her stocking, as Grandma Sara is no longer with us. Grandma Sara made the stockings for Dave and I. 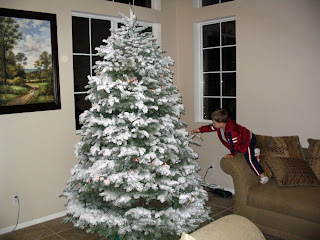 Your house looked great when we came to get Caiden. He was busy telling us all about his tree on the drive up the mountain. He really likes decorations. 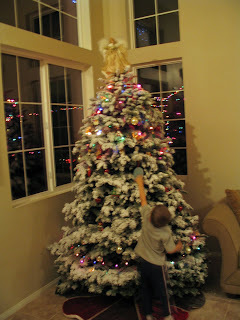 This Christmas will be really fun for him now that he understands about decorating, the tree and of course gifts. 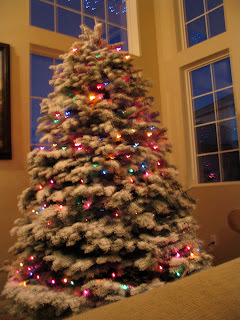 I love your tree...great job! I wish I could flock mine!! 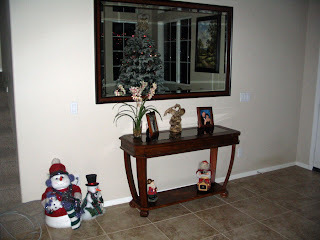 The house looks great Melissa.